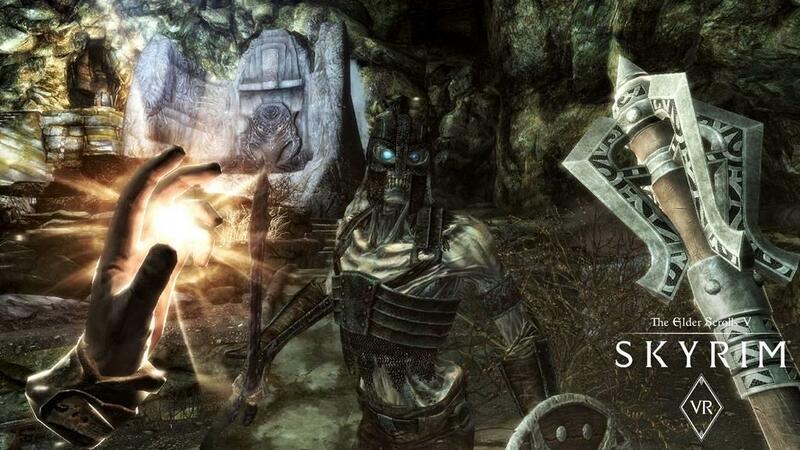 Bethesda announced The Elder Scrolls V: Skyrim VR last year for the PlayStation VR and ever since, PC folk have been waiting for the game to appear on our platform. It took about five months, but the game made its debut on the PC with both HTC VIve and Oculus Rift support. And boy, is it ever fun! Having spent many hours in Fallout 4 VR, I had some expectations for the Skyrim port. Bethesda surpassed even my expectations. Matt didn’t really care for the PSVR version, but I have to say, Bethesda did a great job with the PC version, especially with the beta patch that just came out a few days ago. Performance wise, Skyrim VR ran beautifully on my PC with an i7 6700K paired up with a NVIDIA GeForce GTX 1080. While Fallout 4 had reprojection stats of over 80% at times, Skyrim stayed at a steady pace with around 2% reprojection with my setup. That translates to a very smooth and stutter free experience when wandering the world of Skyrim. I absolutely loved how the game looked in VR. 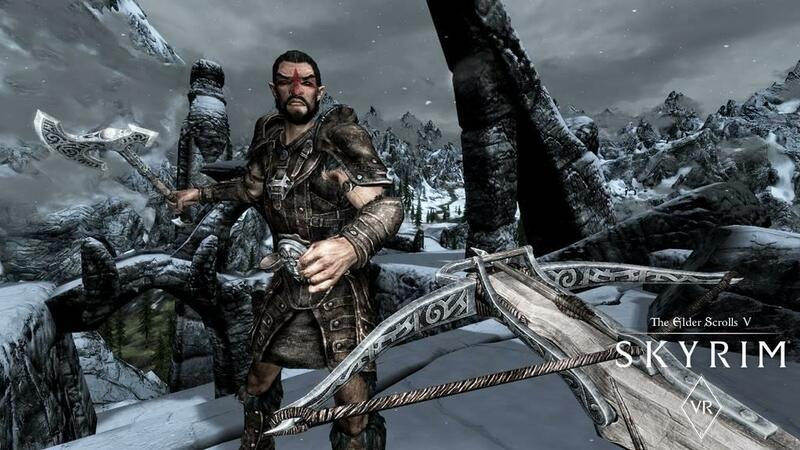 I mean, walking around the various environments that Skyrim has, from the grassy plains near Whiterun to the snow covered mountains of High Hrothgar, you haven’t seen Skyrim until you see it in full 3D VR. There’s plenty of things that really shows off the scale of the world, like walking around some of the large stone statues or up the steps to Dragonsreach. And when a dragon comes swooping down at you in VR, it’s truly an awesome sight to behold. Skyrim in VR looks really really good, but there’s one thing that really makes the game look stunning. Mods can take Skyrim from pretty good looking to being incredibly gorgeous and thankfully, a lot of the old mods work with Skyrim VR. Using a mod manager like Vortex, I was able to load up about 30 mods and get the benefits of some upgraded graphics and it didn’t even affect performance. I highly suggest people go this route and while the game isn’t officially supporting mods, a mod manager can really make this process pretty painless. 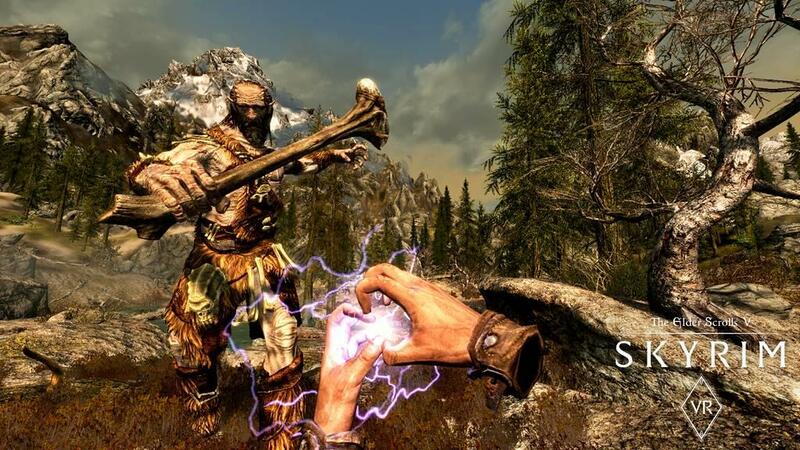 Mods can not only affect graphics, but can enhance VR gameplay. I installed Dragonborn Speaks Naturally, which allowed me to use my voice to speak the dialogue options in order to select them, rather than using my controller to choose what I wanted to say, increasing the immersion. Want to switch to a favorite weapon or spell with your voice? The same mod can do it too. There are others that people are putting out there that can really enhance an already a great VR experience and it’s great to be able to have this option for Skyrim VR. All of the control issues that Matt has are absent in the PC version because of the superior tracking abilities of the HTC Vive and the Oculus Rift. I played the game with the HTC Vive and Samsung Odyssey, which both have its pros and cons. But, I’ll get to those later on. The game can be very dual handed heavy so I did find myself having some issues with my left hand using the shield at times and trying to move. As a person who uses locomotion, it’s hard to move and say hold up your hand to block as the direction of the controller can dictate which direction the thumbpad will move you. Thankfully, Bethesda put out an option to let you switch to an HMD oriented movement scheme whereby where you press is based off of where you are looking, rather than the controller direction. This helped out a lot and being able to move around in VR and fight is an extremely rewarding experience. Firing arrows with a bow is reminiscent of how it is in The Lab from Valve. Just notch the arrow with the right hand, hold down the trigger and pull back, let go to fire. Bethesda introduced an option for a more realistic bow control scheme that I highly recommend everyone turn on and a beta update made the arrow angle a lot more natural. One interesting side effect with moving from the regular Skyrim game to VR is that you can fire your arrows as fast as you can notch them. Essentially, you can almost do a machine gun like volley of arrows to take down your enemies, which is pretty darn silly when you see it. And another fighting limitation that’s removed when going to VR, your speed in swinging a sword is now dependent on how you fast you physically swing your controller. Before, you would have to do a dragon shout to let you increase your swing rate. Not here in Skyrim VR. Chop away as fast as you physically can and you’ll see it is like that in your VR HMD. Some may consider this a little cheat since there’s no weight on the controllers that could limit your swing in real life, but it can be damn fun to do. Those who play Gorn will be right at home with how the weapons feel minus the bendable nature of the items. So Bethesda has done some good job at providing plenty of options to tailor the VR experience to your preferences. From movement options between teleporting and locomotion to adjusting how much if any there are FOV filter there is, they’ve added more and more in subsequent patches since its release. Which, is great since not everyone plays VR games the same and you definitely want more options out there if you’re going to port a popular game such as Skyrim to VR. Bugs, of course, are par for the course in a Bethesda game and the push to VR has produced some new ones that have appeared to make some aspects of the game annoying. Menus that appear in front of you during things like talking to an NPC or shopping can sometimes be obscured by furniture or objects in the area. I’ve experienced a few bugs were items were invisible, yet I could interact with them. For example, one early mission had me using the forge. The problem was, I couldn’t see the forge at all but when I put my controller up to where it was supposed to be, I was able to interact with it. I didn’t have any mods installed and a reload did fix this problem, but it popped up a few times nevertheless. There was a huge bug where your hitbox would not move with you if you played in a room scale environment. Walking around instead of using locomotion or teleporting would produce this bug and it would cause all sorts of havoc as enemies would hit your original location, causing damage and enabling it really hard for you to dodge attacks. Kudos to Bethesda for fixing this issue recently so that was one of the biggest game breaking bugs out there for those who play roomscale Skyrim. Controls with the Vive wands were, for the most part, pretty good except for when you needed to use the trackpad. Sometimes, it was hard to gauge if you were pressing at the top of middle of the trackpad, which will produce different results in the menu. And with the capacitive nature of the trackpads, you’d sometimes move when you don’t want to as your thumb would accidentally swipe it when you don’t mean to. Playing with the Samsung Odyssey, it was a lot easier to keep in control because movement was done with the thumbsticks, giving you a more precise movement. In fact, I found installing one of these Vive control pads made my experience a lot better on my movement hand. While you’d think I would stick with the Windows Mixed Reality setup, I found using the bow was a little less of an optimal experience since moving the arm behind the headset would make it lose tracking. I’ve read the next Windows update makes tracking a lot better, so I’ll definitely revisit it once it comes out. Oh, if you own a Virtuix Omni like I do, Skyrim VR does work if you change the Omni from gamepad emulation to keyboard emulation. Unfortunately, it won’t do decoupled movement so you’ll walk in the direction you’re looking at. I hope someone can come out with a patch or mod that will take into account the direction the Omni ring is facing so we can have try decoupled movement, but it was pretty fun to be able to physically walk around the world of Skyrim in an Omni treadmill. Bethesda did a disservice, in my opinion, charging $60 for Fallout 4 VR and NOT including the DLC. Skyrim VR costs $60 as well, but it does include all the DLC, making it a much better value. I still would have liked it if past owners of Skyrim would have gotten a discount, but then again, almost everyone I know has Skyrim on the PC so Bethesda probably would’ve lost a lot of revenue if it did give out that discount. That said, $60 is a lot easier to swallow for Skyrim VR when it includes all the DLC. 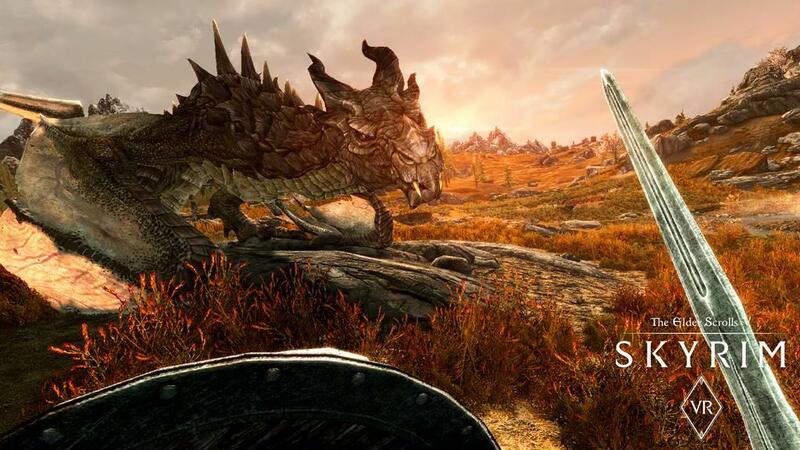 With great performance, unofficial mod support, all the DLC, and pretty good controls, The Elder Scrolls V : Skyrim VR is a great buy for VR headset owners. Even if you’ve played hundreds of hours in the pancake version of the game, I think you’ll really enjoy being immersed in the world of Skyrim. It truly is a brand new experience and it along with Fallout 4 are now two of my favorite VR games to play. It wasn’t a long wait to get it on PC, but it was definitely worth it and Bethesda has done pretty well in making improvements post launch.